Cisco, the networking giant, updates and extends its Connected Grid portfolio along with technology partner Itron; network interoperability will be its key competitive argument with utilities. Ever since it got into the smart grid business three years ago, Cisco has been promising to network every part of the grid. Since then, we’ve seen it deliver on some pieces of that vision, like substation routers and smart meter networks, and back away from others, like building energy management. On Tuesday this week, the networking giant CISCO unveiled its most wide-ranging set of new “Connected Grid” products and services yet, complete with a new network management system to run multiple smart grid systems. Also in classic Cisco fashion, the company has come up with a spiffy blueprint for utilities that it calls the Cisco GridBlocks Architecture (PDF File: Cisco GridBlocks Reference Model) reference model to help utilities put the pieces together. Cisco describes GridBlocks as a “forward-looking” framework that allows utilities to build out their smart grid projects on a modular basis. To its credit, one piece of that architecture, a field area network, is made possible through Cisco’s relationship with Itron. Probably the most important feature of the Connected Grid FAN technology is the face that information from advanced meter infrastructure, distribution automation systems and security controllers can be delivered over a “common” network platform. Cisco’s long-promised field-area network (FAN) solution aims to bridge the gaps between its substation routers and switches being used by big customers like Duke and FPL, and the smart meter networking it’s doing with partner Itron. The FAN comes with a new grid router device, the 1000 series Connected Grid router, as well as the promise of linking up with endpoint devices like smart meters, distribution automation systems and grid monitors and controls. A big question is how Cisco integrates with the smart meter networks already in place from the likes of Silver Spring, Trilliant, SmartSynch, and the big meter makers. That last sentence is really the clincher, isn’t it? While virtually every utility probably agrees that smart grid infrastructure is a smart idea, this sort of investment isn’t trivial. The extent to which utilities can leverage existing pieces of network infrastructure likely will make or break technology choices. Definitely, Cisco with its venerable leadership stance in corporate networking will have a competitive edge if it really plays the interoperability card to its advantage. Cisco also makes some interesting claims for its Connected Grid Network Management System, to wit, “end-to-end monitoring and control of the network communications, delivering enterprise-class visibility that can currently scale to manage up to 10 million endpoints.” We’re going to see an explosion of “network of networks” smart grid offerings in 2012, with big new entrants like Cisco and, most recently, SK Telecom with its GridMaven business. The idea is to bring telecom-level reliability and monitoring capability to the dozens of vendor-specific networks that now run as individual fiefdoms within utilities — but moving from monitoring to control will take some time. Of course, Cisco’s influence in the smart grid extends beyond its named utility projects (or deployments that may be going on under the radar). Cisco has built a long list of partners in the industry, including such high-profile players as General Electric, SAIC, CapGemini, Oracle, OSIsoft, Siemens, Schneider Electric and Verizon, as well as startups including Space-Time Insight, Proximetry, Pulse Energy and many others. It bought wireless networking startup Arch Rock in 2010 and has been applying that technology, built to comply with upcoming IPv6 protocols, in its Itron partnership. Cisco’s GridBlocks Architecture provides utility operators with a communications view of the entire power delivery chain with security woven throughout the design. The modular approach allows utilities to focus on particular elements of their network at any given time and is adaptable to differing market structures and regions. The Cisco GridBlocks Architecture provides a framework in which communications requirements can be specified at each level. It allows customers to take a holistic view of how to evolve their electric grid and design phases of technology implementation. Cisco’s Connected Grid FAN solution simplifies utility operations by enablingapplications such as advanced meter infrastructure, distribution automation, and protection and control to be delivered over a common network platform. The solution has a layered architecture that supports both wired and wireless communications. Cisco and Itron deliver on their strategic alliance announced in 2010 by providing a complete FAN solution that integrates Itron’s smart grid solution onto the Cisco IPv6-based network. This provides a validated, interoperable solution for utilities that allows affordable and accessible upgrades as time goes by. As part of the new FAN solution, Cisco is introducing the 1000 series Connected Grid Router. The router comes in models for outdoor pole-top mount (CGR 1240) and indoor din-rail mount (CGR 1120). Each supports 2G/3G, WiMax and RF mesh connectivity. These ruggedized routers are specifically built to comply with electrical substation standards and designed for outdoor environments. The router has no moving parts (e.g., fans) and is built with industrial-grade components to support an extended temperature range. The FAN solution also includes new endpoints, device management and network management systems that are open and flexible across diverse energy markets, providing a modular solution that can be reassembled as market structures change. The Cisco Connected Grid Network Management System (NMS) provides network operators with end-to-end monitoring and control of the network communications, delivering enterprise-class visibility that can currently scale to manage up to 10 million endpoints. Cisco is expanding its transmission and substation solution to help utilities extend the useful life of their installed base of technology as part of a phased migration to standards-based networks. With this launch, Cisco offers a full set of communication modules for its 2000 Series Connected Grid Routers. 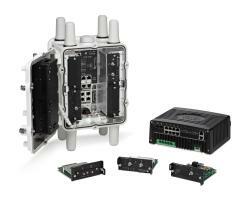 These include the smart grid industry’s first wireless 4G/LTE module, WAN modules to support ISDN, and DSL networks. Cisco has also enhanced security capabilities on the 2000 Series Connected Grid Routers and Switches. This includes the most advanced portfolio of VPN, encryption, access control, and threat detection in the industry. Features include intrusion prevention system (IPS) / intrusion detection system (IDS) and support for SCADA signatures.In addition, the Cisco 2000 Series Connected Grid Routers support synchrophasor deployments with source-specific multicast for efficient transfer and sharing of phasor management unit data across utility boundaries. Cisco has developed a set of tools and professional services to help utilities prioritize their communication investments by performing portfolio-level analysis of solutions on a shared multilayer infrastructure. This helps deliver an optimal design for technology deployment based on proven use cases and business requirements. Cisco has developed the Connected Grid Visualization and Design tool to address the complexity of automating substation communications. The tool allows engineers to visualize in a single interface the energy delivery network CIM diagrams, IEC 61850 protection schema for intelligent electronic devices (IEDs), and the communications network. This helps enable engineers to design, model, and simulate all three networks dynamically, reducing design and deployment time and enabling engineers to standardize designs across hundreds or thousands of substations.